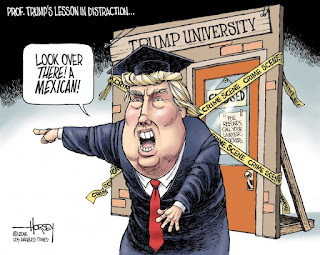 The ghost of Trump University has recently been sighted. Thought to have been put to rest with a $25 million settlement, The Trump U scandal has re-emerged after a new suit was filed Friday. In November, days after he won the presidency, Trump settled three class action fraud lawsuits over Trump University, for $25m. More than 6,000 people were listed in the suits, claiming they were lured into paying up to $35,000 to learn the secrets of Trump’s business success. Now, one member of the class action lawsuits, Sherri Simpson, has filed an appeal against the settlement, claiming she was not allowed to exercise her right to “opt out” of the multi-million-dollar deal. The ninth circuit court has agreed to expedite Simpson's appeal, with a verdict expected in late summer or early fall. If the court rules that Simpson should not have been included in the settlement, she will be free to pursue her own lawsuit against Trump. Here's the good part; she said she will not settle out of court. That means Simpson will be able to sue Trump independently for fraud, which she hopes could see Trump having to testify before a jury. As the ninth district court ponders Trump's fate I see some irony unfolding. In May 2016 a Ninth District Hispanic judge, Gonzalo Curiel, made public more than 400 “playbooks”, which showed how the Trump University staff were instructed to get people to accrue credit card debt to pay for tuition fees, and ordered to target financial weaknesses in a bid to sell further courses. Trump, who launched his campaign by accusing Mexico of sending “rapists” to the US, attacked Curiel over the release. That didn't get him anywhere. As a matter of fact it was the Ninth District court that has repeatedly stopped Trump's travel ban against Muslims. It seems to me the Ninth District Circuit court knows Trump all too well. Just guessing, but I think Simpson's chance for getting Trump into a court trial look pretty good. One reminder; Trump U was before Trump was president, and as such, he can be tried as a civilian.